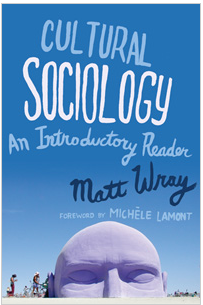 Teaching cultural sociology and looking for a textbook? This new collection of essays may be just what you’re after. Cultural sociology has grown to exercise a deep influence on other subfields over the last forty years, on areas such as the study of race and ethnicity, education, social movements, economic sociology, and political sociology. This mix of essays is an essential resource for understanding this fast growing, dynamic area of sociology. An introduction outlines the building blocks of a sociological approach to studying culture, and helpful headnotes guide students through each reading. See the publisher’s website for an overview of included essays and PDF access to the introductory chapter. On June 5, 2013, Bruno Latour, French sociologist and anthropologist, was awarded The Holberg International Memorial Prize. The prize is awarded annually to scholars who have made outstanding contributions to research in the arts and humanities, social science, law or theology. Check the website for further information about the prize, details on the award ceremony and a video recording of Latour’s acceptance speech. The call for papers for the ISA World Congress of Sociology 2014 is out! Held only every four years, this is a great opportunity to showcase your work to the international sociological community. 300 word abstracts need to be submitted online by September 30th, 2013. For details on how to submit a paper please see the conference website. The ISA Congress is structured around Research Committees, Working Groups and Thematic Groups. By clicking on these in the above link, and then following along the relevant sections, you can peruse their proposed conference streams and tailor your submissions to one of the many options. RC 16 on Sociological Theory will be of particular interest to many of us cultural sociologist. Our very own, Brad West, is organising a great session on National Futures. The session invites papers that examine the future of the nation and the establishment of interconnections between the global and national. Where once there was a general consensus that the nation is an outdated source of identity with little role to play in a ‘global’ future, an emerging literature is considering the possibilities of national re-enchantment, the significance of national entities in addressing global problems and broadly the different ways national traditions interact with postmodern forces. This works fills an important gap in the literature on global transformations. Despite most globalization scholars no longer assuming that cultural influences across state boundaries result in a mono-culture, the nation is frequently lost within the local/global binary. The theme also addresses key failings within sociological theory that while long acknowledging the adaptive powers of capitalism, has conceived of the nation in terms of its inherent qualities that either endure or disintegrate in the face of contemporary socio-political change. This session thus invites papers that seek to consider the ways in which the nation might have a viable future. Possible themes for papers are how national traditions withstand or incorporate global influences; the role of ritual in national collective memory being reimagined in culturally relevant ways and the constructive role the nation can play in addressing global issues such as climate change, humanitarian aid and terrorism. Enjoy checking out the sessions and getting inspired to make your submissions. Hope to see you all in Yokohama in July 2014!